Strength training, also called weight training, is performing any type of resistance exercise that will build the strength and/or size of the skeletal muscles. There are a variety of ways in which you can strength training. Of course, the most common is by using weight machines at the gym. The benefit of weight machines is that they isolate each muscle group and also provide a level of comfort and safety for a new exerciser. Free weights, such as dumbbells and bars are also common at a fitness facility but require more core stabilization and are, therefore, often used by the more experienced exerciser. Really, any type of equipment that will provide resistance to the body can be categorized as weight or strength training. Kettlebells, bands, or even water jugs will work. In addition to using equipment, one can obtain strength benefits from using your own body weight by doing things like push-ups, chin-ups, dips, lunges and squats. Regardless of the type of strength training you choose, you can accomplish different outcomes by the number of repetitions and sets you perform. A repetition is the number of times you do a particular movement. For example, you do 8 bicep curls. A set is the number of times you do the exercise for a specified number of repetitions. To improve overall strength, you would perform 6-8 repetitions and do multiple sets (2-4) with a short rest period between each you will improve your overall strength. To increase the amount of lean body mass, which is especially useful for weight loss, you would perform 8-12 repetitions relatively slow for 1-3 sets with s shorter rest period in between sets. Finally, for people wanting muscular endurance to perform things like rowing or biking, you would do a higher number of repetitions (20), at a moderate pace for 1-3 sets with less than one minute rest in between. Whatever type of strength training you choose, it’s important that you train safely. Be sure to work on your technique (also called form) first. This will make the exercises more effective but most importantly prevent injury. Proper form means controlling the weights (versus swinging) and using a full range of motion but not locking out your joints. In addition, make sure you rest a minimum of 48 hours in between strength training sessions so your body has the proper amount of time to repair. Even small increases in muscle strength can make a big difference in your body tone and your ability to easily carry out everyday activities. People who maintain strength have an easier time getting in and out of cars, climbing stairs, carrying kids or groceries, or even playing their favorite sport at a high level. 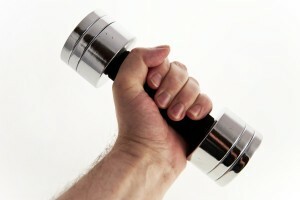 Improving muscle strength is accomplished by performing “strength training” or “resistance training” exercises.